An unidentified class 146 worked RE19048, the 17:19 from Singen to Stuttgart, down Primtal towards Neufra on the evening of 10 May 2013. A brief visit was paid to this line, another favourite, on the way home from Switzerland. The passenger service is basically unchanged from last year. 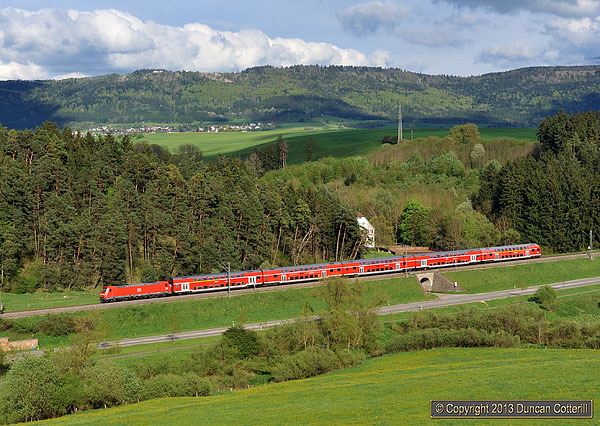 The two-hourly InterCity trains from Stuttgart to Zürich continue with either class 101 or 120 locos on the vast majority of trains and class 115 or 181 locos appearing on a handful of services at weekends. 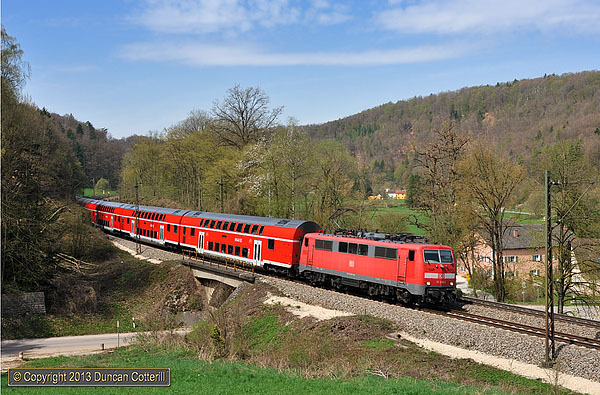 Two-hourly, 146 worked, Stuttgart – Singen trains alternate with two-hourly Stuttgart – Rottweil class 425 EMUs and Hohenzollerische Landesbahnen class 650 railcars work local services south of Rottweil. Only one freight was seen, an oil train hauled by a pair of DB class 185s on the Saturday morning. This was consistent with freights observed in previous years. Only two loco hauled trains were photographed in sun and one of those was worked by a class 101 in a silly livery. The other train, a 146 hauled RE, produced a nice shot. Germany provides a huge variety of picturesque locations, trains, locomotive types and liveries to keep the discerning photographer happy. Travel is relatively easy, whether you use the trains or go by car, accommodation is generally of a high standard and reasonably priced, good food and excellent beer are readily available and the natives are friendly. Once they sort the weather out it will be almost perfect. 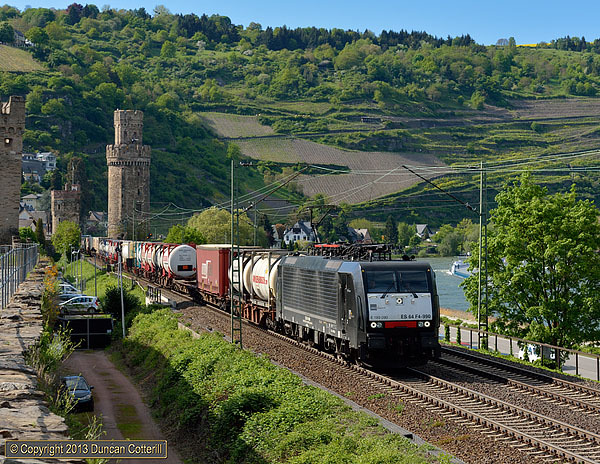 MRCE Dispolok's 189.090 passed the leaning towers of Oberwesel with a southbound intermodal train on the afternoon of Saturday 11 May 2013, a good example of what is readily available. This trip was hard going, even compared to the previous year’s Spring visit, which I thought was difficult at the time. Once again, the weather was largely to blame with large amounts of cloud and little sunshine. My threshold for a good trip is 50% sunshine but on this trip it was barely 25%, and most of that was in the first week when trains worth photographing were few and far between. Thankfully the handful of good days tended to be very good with crystal clear light. My aim had been to do as many new locations as possible and try not to repeat shots that I’d already done. It’s very easy to keep on going back to the same old locations, time after time, especially if you’re not sure that there’s anywhere better. At least the poor weather allowed plenty of time to explore and find alternative spots. Once again, I was amazed by how many good new locations there were, even on lines I’d been visiting for years and thought I knew very well. In the event, virtually all of the shots I got were in new locations or, at least different in some form to what I’d done before. I'm not unhappy with what I got, particularly as so much of it was new, and the time taken exploring will pay dividends in the future, so the trip wasn't awaste of time by any means. Despite getting some of the shots I wanted, I still returned with a longer list of wanted shots than I started out with. Diesel hauled freight is under threat in Germany and elsewhere. Gaps in the electrified network continue to be filled and traffic tends to be sent on all-electric routings, even if it involves considerable extra mileage. The area north and east of Nürnberg is about the best of what's left with good scenery and photogenic diesels but traffic levels were very low during my visit. Most days only produced four trains, three of them bunched together in the early morning, rather than the six or seven expected. 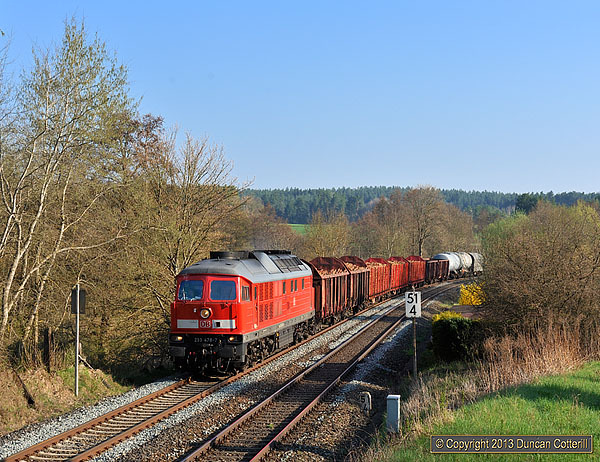 A smart 233.478 approached Neuhaus (Pegnitz) with train 45360, the 06:00 freight from Cheb to Nürnberg Rbf, on 26 April 2013. There were some disappointments on the rail front as well, including the lack of a class 103 on IC118 and IC119, although the 120s that appeared in its place aren’t particularly common in the Rhein Valley and well worth photographing. The dearth of midday freight traffic on the Nürnberg – Hof line was frustrating but it’s getting very difficult to find heavy diesel hauled freights anywhere in Europe these days and this line is still one of the best places to see them, even if you don't see very many. The frustration was tempered more than a bit by the good light and the new shots that were obtained when the freights did run. The Ulm – Friedrichshafen line exceeded my expectations in every respect apart from the weather, which was dire most of the time. The photo locations were more plentiful than expected, often better than expected and generally easily accessible, making the line suitable for a future rail based trip. I had seen a few pictures of the stone train but got the impression it was an occasional working. Finding that it ran Mondays to Fridays was an unexpected bonus but I’ve still got to get a shot in sun. I had hoped to spend several days on the Memmingen – Hergatz, Biessenhofen – Füssen, Immenstadt – Oberstaufen and Immenstadt – Lindau lines but the bad weather kept me on the Ulm – Friedrichshafen line for more than a week, desperately trying to get some pics in good light. All i managed on the other lines was a couple of brief visits to Immenstadt – Lindau on the last weekend. Again, plenty more to do on a future trip. As always, many thanks to those who produce the loco diagrams and post their own observations and other information. Hopefully the notes and pictures here will help others make the most of their own trips to Germany. Southern Germany has huge potential for railway photography with excellent scenery, loco hauled passengers, and diesel freights but it won’t last forever. New, and not particularly attractive, diesels will soon start to replace the 218s working from Kempten and Mühldorf, new EMUs are reducing the number of regional passenger trains worked by classes 111 and 143. Diesel hauled freight is also in decline and the variety of traction used is steadily reducing with class 225 now becoming rare. Make the most of it while you can. Loco hauled passengers are under threat with new EMUs and DMUs replacing locos and coaches all over Germany and the trend shows no sign of slowing. 111.200 curved through Möhrenbachtal with RE59122, the 11:26 Augsburg - Nürnberg semi-fast, on 26 April 2013. Half the Regio Express services on this section of line are now in the hands of new class 440 units and the first 111s are now being withdrawn.